Movie star looks and multi-talented: Oka Masafumi, knife maker. 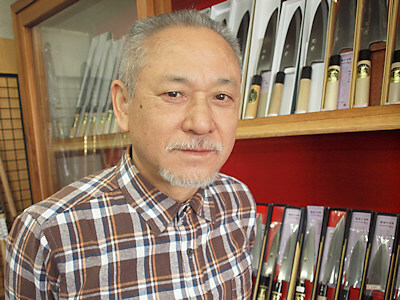 In an amusing twilight zone moment, the first time we sat down over green tea and manju cakes with Oka san, surrounded by an impressive array of his beautiful knives displayed under glass all around, he told us with a glint in his eye that he doesn't consider himself to be a knife maker. Double take! But the confusion didn't last. It turns out that knives are not all that Oka san forges, and in spite of appearances they are not in fact the main game for him - that is, knives are not what he's famous for. And he's more than a little bit famous. Mr Oka is celebrated nationwide as the last craftsman in Japan producing hand-forged, hand-shaped, hand-sharpened noko-giri wood saws. They are amazing and beautiful and one of them will soon be ours! We digress. Mr Oka is indeed a knife maker, and a very fine one, and he produces fine knives, a modest selection of which we're proud to now offer here at Knife Japan.